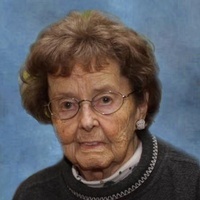 Betty Ann Shilling, age 96, of Brandenburg KY, formerly of Sharon, PA, passed peacefully at her residence March 23, 2019 after a brief illness. Betty was born July 16, 1922 in Bluefield WV to the late Claudia Craig Harper and Lindsey Harper. Her husband Harry Malin Shilling preceded her in death. Betty attended the Brandenburg United Methodist Church and Radiant Church in Brandenburg. She also volunteered at the Jewish Center in Brandenburg. She is survived, and will be greatly missed by her daughter, Claudia Stull and her husband Ed Stull, her granddaughter, Clover Traughber (Charlie Traughber), of Crestwood KY, Mike Stull, Brandenburg KY, Steve Stull, Sample KY and great-grandchildren Keely and Nate Traughber, Crestwood KY, Kaci and Mia Stull, Brandenburg KY.
Burial will be in Mt. Washington Cemetery in Mercer. Expressions of sympathy may be made to Hosparus Health of Central Kentucky, P.O. Box 2149, Elizabethtown, KY 42702-9900.